Longer life pavements can be achieved as a policy objective in new, rehabilitated, and reconstructed pavements and are generally justified for higher volume facilities. Design lives may range from 30 to more than 60 years and can be accomplished using both asphalt and concrete designs. Longer life design options should be considered for new corridors and rehabilitation of existing pavements that are severely distressed and may also possess geometric deficiencies, and may afford the opportunity to reduce life-cycle costs, user delays, and environmental impacts as compared to a standard, 20-year pavement design. A general rule for load-related cracking is that as critical tensile strains or stresses decrease (for either concrete or asphalt pavements), the overall structural capacity of the pavement (i.e., the number of truck loads it can carry) increases logarithmically. Therefore, when there are heavy volumes of traffic, higher structural capacity can be achieved by increasing the bending resistance of the pavement; this can be accomplished by increasing the thickness or by increasing the material stiffness (or both). Longer life designs can select innovative combinations of layer thicknesses and materials to achieve this, including the use of recycled materials in the lower layers. However, effective material and construction specifications are essential in order to reduce variability and maximize the performance of the selected materials. Because of the increased thicknesses or increased material stiffnesses, longer life designs may increase initial costs and possibly initial environmental impacts, but the overall life-cycle costs and environmental impacts over the life cycle are expected to be less. Reduction in the amount of asphalt mixture through the selection of materials and construction requirements for better compaction that produce greater bending resistance than conventional materials; this reduces the cross-sectional area compared with what would be required with conventionally designed and compacted asphalt mixtures. Incorporation of higher quantities of reclaimed asphalt pavement (RAP) combined with stiffer and less viscoelastic asphalt binders in the middle layer; this reduces the amount of new asphalt binder used (and its commensurate environmental burden) and provides increased stiffness and reduced viscoelastic energy dissipation. Use of modified open-graded surfaces to reduce noise, slow stormwater runoff, and trap pollutants, and provide a sacrificial layer for top-down cracking. Use of recycled concrete pavement or building waste as the granular base layer. A fatigue-resistant bottom layer is provided that resists damage under tensile strains caused by traffic, and thus stops cracks from forming in the bottom of the pavement. 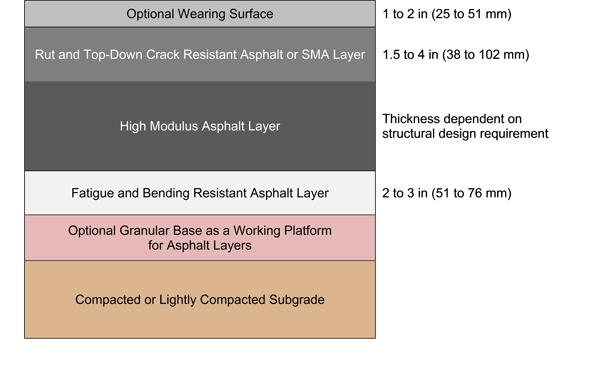 This bottom-up fatigue cracking resistance can come from increasing the total pavement thickness such that the tensile strain at the bottom of the base layer is insignificant (which requires more asphalt), or by specifying air voids to between 0 and 3 percent and slightly increasing the asphalt content to achieve this high level of compaction (referred to as a "rich-bottom" layer). The next layer is designed specifically to increase the bending stiffness through the use of stiffer conventional asphalt and potentially higher RAP contents. This layer can also have an increased compaction requirement to increase the stiffness and fatigue resistance of the section. The third layer from the bottom is designed specifically to resist surface-initiated distresses such as top-down cracking, rutting, and low-temperature cracking (where applicable). Some typical mixtures used for the surface layer are polymer-modified asphalt concrete and stone mastic asphalt (SMA). ME pavement design procedures can be used to design the structure considering the different pavement materials (Timm and Newcomb 2006; Buncher and Newcomb 2000; Newcomb, Willis, and Timm 2010; Harm 2001). A fourth layer-typically either a high-quality polymer- or rubber-modified, open-graded or gap-graded mixture or a 1 to 2 inches (25 to 51 mm) SMA-can be placed on top of the rut resistant layer and is designed for abrasion resistance and vehicle safety. This layer is considered to be a sacrificial layer in a 30- to 50-year long-life asphalt pavement. Once its effectiveness is diminished (approximately every 10 to 15 years), it can be removed, recycled, and replaced. Many open-graded and SMA mixtures used for this layer can provide tire-pavement noise reductions when compared to dense graded materials (Rezaie, Harvey, and Lu 2012). Figure 1. Perpetual pavement cross section. For longer life structural overlays, the prudent use of polymer-modified asphalt materials may also be a way to achieve longer life (as compared to conventional materials). Polymer-modified asphalt can extend the life of the surface by increasing rutting resistance and decreasing susceptibility to top-down cracking. It can also be used to decrease reflection cracking in an overlay application. The increased life can help decrease the frequency of maintenance and rehabilitation, thus reducing some environmental impact. However, polymer modification should be used where its benefits are of most value, because polymer modification may increase overall greenhouse gas (GHG) emissions of the asphalt pavement design due to the manufacture and production of the polymer itself (Bernard, Blomberg, and Southern 2012). Longer life concrete pavements (either jointed-plain concrete pavement [JPCP] or continuously reinforced concrete pavement [CRCP]), with anywhere from 35- to 60-year design lives, are designed to maintain structural integrity and require only periodic retexturing of the surface to restore smoothness, friction, and noise performance. Longer life concrete pavements are designed to resist the heavy truck traffic that will cause repeated load distresses such as fatigue cracking, faulting, and punchouts. These design objectives are achieved by using durable concrete mixtures, adopting slightly thicker concrete slabs placed on non-erodible bases, including properly designed and corrosion-resistant dowel bars or reinforcing steel, and incorporating stress-relieving design features such as tied concrete shoulders or widened slabs. Figure 2 shows an example of a longer life CRCP designed for fatigue resistance and low maintenance requirements. The life-cycle environmental benefits of the longer life CRCP have to be evaluated using LCA and compared to the environmental impacts associated with the inclusion of the steel reinforcement. Figure 2. Example of CRCP longer life design. Designing for the incorporation of local materials to reduce transportation costs should be considered for all aggregate materials, whether they are used in asphalt, concrete, or unbound layers. Minimization of earthwork hauling for the roadway foundation is also another consideration. Alternatives can be analyzed to minimize both costs and environmental impacts. Accelerated construction can be employed that minimizes the duration of construction and associated lane closure times. Construction processes and materials such as rapid-setting or high-early-strength concrete, modular concrete, or rubblization/asphalt overlays are examples of accelerated construction. Each of these options will expedite the construction process, thus reducing user delays, reducing emissions, and improving safety (by reducing the risk of crashes). In many situations involving multi-lane highways, the outer (truck) lanes may be in need of a structural rehabilitation or reconstruction, while the inner lanes are still in relatively good condition. If a thick overlay (concrete or asphalt) is needed on the truck lanes, the inner lanes must receive the same treatment in order to maintain elevations. In these cases, consideration could be given to the reconstruction of the outer lane, with the new pavement structure either matching the surface elevation of the inner lanes, or perhaps slightly higher to accommodate the placement of a thin overlay on the inner lanes to restore functional performance. Computations can be made for the environmental impact of each scenario (complete overlay vs. outer lane reconstruction), including consideration of the recycling of the existing pavement and associated traffic delays. Local reconstruction of the outer traffic lane can also be considered on corridors with mixed pavement types (i.e., different pavement types in adjacent lanes), provided that this does not impose any major maintenance issues. Existing asphalt pavements can receive either an inlaid reconstructed asphalt or concrete outer lane, and existing concrete pavements can receive new inlaid concrete truck lanes and an asphalt overlay on the passenger lanes that matches the elevation of the outer lanes. There are also opportunities for inlaid reconstruction with semi-rigid pavements in the truck lanes. The pavement materials that are removed can be recycled next to the construction site into the new truck lanes. For more information, see Chapter 4 (.pdf) of the Reference Document. Bernard, F., T. Blomberg, and M. Southern. 2012. "Life Cycle Inventory: Bitumen." International Symposium on Life Cycle Assessment and Construction July 10-12. CSTB, Nantes, France. Brand, A. and J. Roesler. 2013. Two-Lift Concrete Pavement with Recycled Construction Materials. Illinois Center for Transportation, University of Illinois, Urbana, IL. Brand, A., J. Roesler, I. Al-Qadi, and P. Shangguan. 2012. Fractionated Reclaimed Asphalt Pavement (FRAP) as a Coarse Aggregate Replacement in a Ternary Blended Concrete Pavement. 12-008. UILU-ENG-2012-2014. Illinois Center for Transportation, University of Illinois, Urbana, IL. Buncher, M. D. and D. Newcomb. 2000. "Perpetual Pavement." Asphalt Magazine. Vol. 15, No. 3. Asphalt Institute, Lexington, KY. Harm, E. 2001. Illinois Extended-Life Hot-Mix Asphalt Pavements. Perpetual Bituminous Pavements. Transportation Research Circular 503. Transportation Research Board, Washington DC. Newcomb, D., D. Willis, and D. Timm. 2010. Perpetual Asphalt Pavements: A Synthesis. Asphalt Pavement Alliance, Lanham, MD. Rezaei, A., J. Harvey, and Q. Lu. 2012. Investigation of Noise and Ride Quality Trends for Asphaltic Pavement Surface Types: Five-Year Results (.pdf). UCPRC-RR-2012-04. University of California Pavement Research Center, Davis and Berkeley, CA. Roesler, J., J. Huntley, and A. Amirkhanian. 2011. "Performance of Continuously Reinforced Concrete Pavement Containing Recycled Concrete Aggregates." Transportation Research Record 2253. Transportation Research Board, Washington, DC. Snyder, M. B., J. M. Vandenbossche, K. D. Smith, and M. Wade. 1994. Physical and Mechanical Properties of Recycled PCC Aggregate Concrete - Interim Report-Task A. Federal Highway Administration, Washington, DC. Sturtevant, J. 2007. Performance of Rigid Pavement Containing Recycled Concrete Aggregate. MS Thesis. University of New Hampshire, Durham, NH. Timm, D. D. and D. E. Newcomb. 2006. "Perpetual Pavement Design for Flexible Pavements in the U.S." International Journal of Pavement Engineering. Vol. 7, Issue 2. International Society for Concrete Pavements, Taylor & Francis, New York, NY.